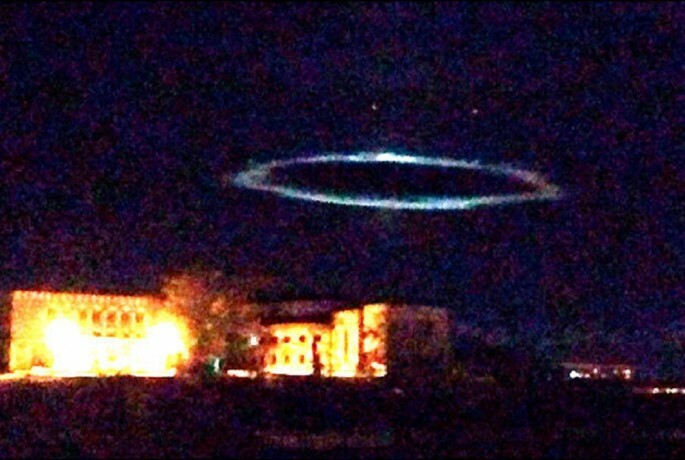 A Russian woman claims she saw a saucer-like object hovering over the skies of Ulan-Ude, the capital of Buryatia in Russia. She describes the UFO as having a lot of green lights and some blue and red lights too. She took a photo of the object and posted it on Vkontakte, a social network site which is the equivalent of Facebook in Russia, reports Daily Star. The witness was with her son and two passersby when the UFO appeared, disappeared and reappeared. She said it sounded like the noise of a car engine which led the two male passersby to think it was a drone or a toy plane. But when it stopped in front of them, the two men ran and hid inside a nearby building, thinking probably it would capture them. Her son too became scared and grabbed her hand and the two also fled the scene. She told Siberian Times, "I never believed that something like that could exist." Other Ulan-Ude residents apparently have been witnessing the same phenomenon. One resident reports seeing from his balcony regularly in the middle of the night a bright glowing object in the sky. Another saw red lights in the sky which later disappeared. Last week, Russian photographer Vladimir Voychuk from Klin spotted lenticular clouds hovering the volcanoes of Kamchakta in eastern Russia. Because of the cloud's appearance that resemble a space ship, many Russians also mistake the natural phenomenon for a UFO sighting, reports Daily Mail. Besides Russia, there have been alleged UFO sightings in Manipur, India and at the Heilontan Reservoir in the Chinese province of Sichuan. An online survey of Daily Star show that 86 percent of its readers believe in aliens. Is China’s ‘City In The Sky’ An Optical Illusion Or A NASA Project To Fake 2nd Coming Of Christ?